So, about that weekend post that got mentioned on both the front and back ends of the week, today is reminder day. I’m only listing deconstructions that had additions since our last Deconstruction Round-Up. I was going to have a section for several new deconstructions that we were going to add this week, specifically all the ones for which we had no contacts last week, but WordPress ate all that data (and seemed to have eaten the entire post for a heart-freezing, rage-inducing moment) after I spent two hours working on it, so if I want this to go up today I’m going to have to skip that. I will try to edit tonight or tomorrow to add those deconstructions. ETA: Yes, I know these are the exact same links as last week. This post got more messed up than I thought when WordPress glitched on me. I’ll fix it when I regain consciousness. Latest Post: Elsie Dinsmore Deconstruction: The Readers Have Spoken! Please comment or e-mail us if we’ve forgotten anybody or you have anyone to add. We’ve got nothing on the schedule page for today, and nobody’s touched the forums in weeks, so… let’s talk upcoming articles, roundtables, and so forth. Anyone have anything they wish to volunteer for one of those dates? Also, there’s been discussion of a few roundtable possibilities; do we want to try to do one or two of them in December? ETA: Also, I hereby volunteer to be Keeper of the Schedule, which as I see it would consist of updating the Schedule page daily and possibly sending a reminder e-mail to whoever’s supposed to be posting that day? I’ve discovered some lovely sources of cute animal photos in the past two weeks, which should provide a sufficient supply of adorable for some time. Today I’m spotlighting a new favourite: The Sarcastic Bunneh Show on Facebook. 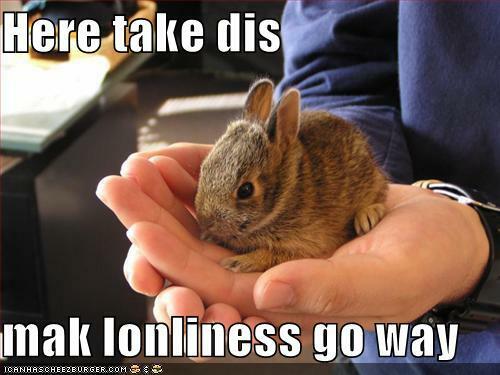 Nobody puts Bunny in a corner! 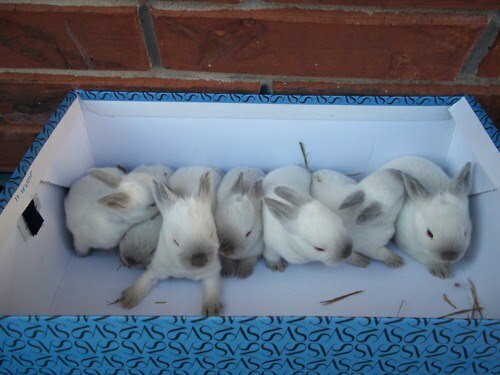 According to The Sarcastic Bunneh Show, this is what happens when bunny slippers are left unsupervised. I think I need some bunny slippers. 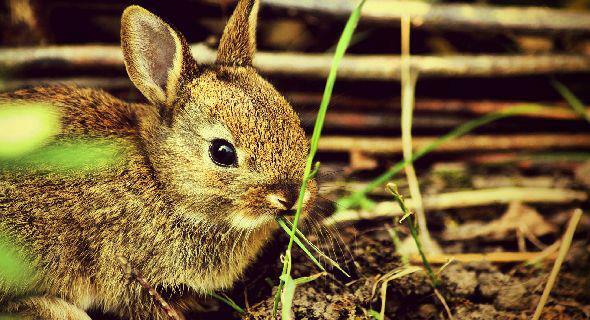 Baby bunny slurps up grass. 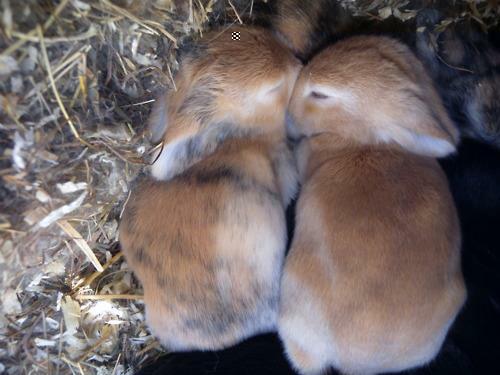 Tiny snugglebunnies in their nest. 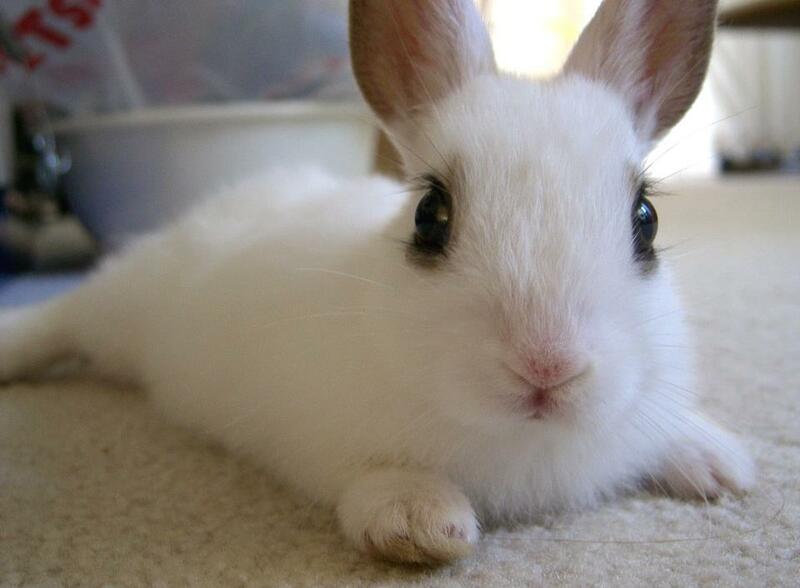 Beautiful long eyelashes in the midst of soft cottony fluff. No mascara needed! Okay, I know that was more than a couple of pictures. I just couldn’t resist. 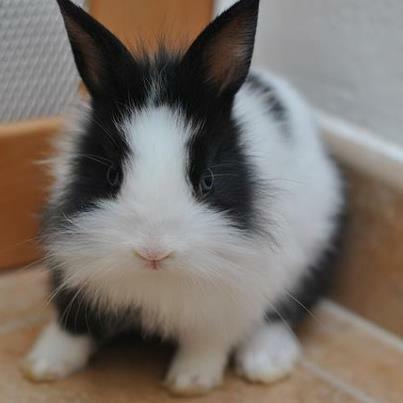 So many cute bunnies on that page! Have a great week filled with adorable animals! On Cate’s Cates, I had a ball at the Farmers’ Market, made strawberries and cream and had a very disappointing High Tea at the Grand Hyatt, the description of which degenerated into a discussion of apoptosis. Over on my music blog, I noted that my choir was singing about dragons and was delighted by Kristin Chenoweth singing The Girl in 14G – if you listen to one bit of music theatre this week, make it that one, because it’s incredibly clever and very well-sung! Last week, as she worked to prepare her garden for the winter, Storiteller ran into an odd ethical dilemma. Raking up leaves in the nearby cemetery seemed like a good public service, but felt very wrong when someone came to visit, as she describes in Gravestones and Garden Prep. This week, among all of the very many things she has to be grateful for, she focused on just one – her local farmers’ market. She lists a few of the reasons why in Giving Thanks for Local Agriculture. As part of her (very) inconsistent feature, she highlights the work of one of her favorite charities and how you can donate to them as a gift for others in Fangirl Friday: Oxfam. I listed my Thanksgiving 2012 blessings. For the first time in many years we really did go over the river though not through the woods to eat dinner at Nottaway. And while we are on the theme of thankfulness, I wrote about the one bright spot in a dark time in my life in Thanks a Lot, John Metz. Once again, I have only My Little Po-Mo to report. I’m working on something else, but it’s still in the very early stages. Anyway, last week I posted I’m the monster. (Dragonshy), in which I discussed how MLP implements the Buffy approach to writing villains as a method of exploring the adventure/character binary. Coming up, at midnight EST this link will work: Honey, Rarity thinks everything’s uncouth. (Look Before You Sleep), which is about kyriarchy and the intersection of class and gender. On the whole Greek Myth NaNoWriMo thing I wrote (not quite in this order) to ask if people weren’t liking it, an invocation to the Muses, the line of Pontos (lots of Hercules killing things there) and, after actual research failed to turn up much on the vast majority of the Nereids besides their names, made up additional information on each of the unstoried ones. As an aside, the probability of me hitting 50,000 words by the end of the month is just about zero. Not quite zero, but it doesn’t take a large epsilon to get the two in the same neighborhood. I am to blame for Advent Knowledge, an education Advent calendar project. Contributors post every day on their chosen topic, or add to the eclectic general pool if they only want to make a few posts, and we are always looking for more contributors. Any and all topics are welcome. This year, we have a website! Come to www.advent-knowledge.info for more details and to sign up. And then come back every day in December, to read about (at the least) chemistry, art history, ecology and atmospheric science. Ellie Murasaki writes: https://petitions.whitehouse.gov/petition/require-producers-goods-us-markets-use-same-wage-and-worker-safety-standards-outside-us-inside/54wVDg3V because one Triangle Shirtwaist fire should have been enough. For our first Deconstruction Round-Up, we’re going to do it a little differently from future posts: For each deconstruction, we’ll have links to the site/blog/whathaveyou that hosts the deconstruction, the first post in the deconstruction, and the most recent post. Posts are in alphabetical order by creator name (in the rare case of a creator with a first and last name, we used first name). As always, if you know of any deconstructions (ongoing or complete) please let us know in the comments. If you have contact information for anyone on that list (or are on that list) please contact us at slacktiverseauthors (at) gmail (dot) com. I (chris the cynic) hope you had a better thanksgiving than I did if you celebrate such, and I better day than I did regardless. If you didn’t, perhaps tomorrow will be better. Sunday: Intentionally left empty because the Weekend post doesn’t go up until late Saturday so Sunday is the day it’s out front. Tuesday: Cute Animals because someone wanted them and no one said they didn’t. Saturday: Article/Open Thread posted early in the day, Weekend post hopefully up by the end of the day. Physical Limits: The thing you want to do may be impossible, either because no one can do it (I cannot levitate myself telekinetically) or because you personally cannot do it (no matter what I do, I will almost certainly never run a four-minute mile). Time Availability: Related to physical constraints, temporal constraints are ones which result from the fact that there are only so many minutes in a day and so many days in a lifetime, and you can only be in one place at a time. I could either have pursued becoming a bassist or a writer, not both, even though either is technically physically possible. Resources: These are the things you can’t do because you don’t have access to the required resources. I can’t rent out every bar and hotel in Liechtenstein for a party, but somebody much, much wealthier than me probably could. That last restriction, resources, is the one I want to talk about. See, the thing about any constraint on freedom is that, as you have more of the limiting factor, it becomes less of a constraint. What I mean is, if someone has lots of free time but not a lot of resources, giving them more free time is going to increase their freedom less than giving them more resources. Likewise, if someone is a billionaire with a terminal disease, an extra year of life is going to increase their freedom more than a few million extra dollars. As your resources increase, you eventually reach a point where resources just stop being a limit on your freedom. When you have a yacht, a jet, an island of your own, and money to spend, there isn’t much that you can’t do, resource-wise. Gaining more resources doesn’t get you any more freedom–and conversely, losing resources (so long as you don’t lose to much) doesn’t cause you to lose any freedom. What increased resources does get you, once you’re past the point of diminishing returns, is power. When you have a lot of wealth, you can alter the choices of others. You can do this overtly and directly (if you buy voting stock in a company and downsize it, you increase the resource-based restrictions on the freedom of its employees) or subtly (you can alter what goods that company creates and in what quantity, changing the options available to others). You can influence elections with campaign donations, or just enjoy watching people have to work to please you, since you control their salaries. Or, for that matter, you can donate to charity, help out others, and use that power for good. Either way, the resources you’re expending aren’t changing the options available to you, they’re changing the options available to others. For purposes of this essay, those are the definitions we’ll use: Freedom is the ability to do what you want, power is the ability to change whether others can do what they want. No Income Tax: Usually, proponents of this approach aren’t total anarcho-libertarians; they accept that some form of government is needed, and that it must fund itself through some form of taxation, so they argue for a sales tax of some sort. The argument for this approach is that people are taxed according to what they spend on consumer goods, which is somehow fair while taxing people based on the size of their paychecks or investment returns or what they spend on the stock market is somehow not fair, because wiggly finger motions and look over there while I run away! “Flat” tax: Everyone pays the same percentage of their income. This system is supposed to be fair because, well, everyone pays the same percentage of their income. Progressive taxes: The percentage you pay depends on your income. The simplest form is a flat tax with a floor: If you make less than X dollars, you pay no taxes. If you make X+Y dollars, you pay a fixed percentage of Y. More complex systems have more brackets, but the general principle is that you pay nothing on the first X dollars, a small percentage of the next Y dollars, a slightly larger percentage of the next Z dollars, and so on. This is supposed to be fair because wealthier people get more out of society, so should be expected to pay more in. So, which is fairer, a flat tax or a progressive tax? As a general rule, libertarians and conservatives argue the former, liberals the latter; I think it’s pretty clear which is correct, however, if we consider it in terms of the definitions of freedom and power we established above. It is, after all, obviously and inherently unfair for one person to have the ability to control whether and in what forms another person has freedom. The only way in which power can be fair is either if it does not exist, which is impossible (in any system, if no one has the power to stop bullies, then bullies have all the power), or if it is shared as broadly as possible. In other words, it is unfair if one person gets to decide for everyone what freedoms we can and cannot have, but if we all get together and collectively decide that, say, murder is not allowed, that is fair because everyone gets a say. Consider, then, a flat tax as you climb the economic ladder. For the very poor, a flat tax is a major reduction in freedom, since they already are badly constrained by resource availability and the tax makes it worse. Eventually, however, we reach levels where the tax is barely a reduction in freedom at all–if my income is $200 million a year, my level of freedom is basically the same as someone making $20 million a year, and therefore I can pay a 90% tax and not experience any loss of real freedom. What I do lose, in that scenario, is power. However, in most places where this article is readable that money ends up in the hands of a democratically elected government. Even given a government as corrupt and distorted as the current U.S. federal government, even given filtering through representatives and the constraints of the two-party system and gerrymandering and voter suppression (if you live somewhere other than the U.S., substitute the imperfections of your country’s government instead), the average person on the street still has far more say in what the government does with its money than they do in what I do with my money. Thus, the government getting to decide how to use that power is fairer than me getting to decide. Remember that money is, ultimately, imaginary. It is what money represents that matters: resources, which is to say, freedom and power. A flat tax takes freedom from the poor, but not the rich, and does nothing to address the power imbalance between rich and poor; it exacerbates the unfairness that already exists. A well-designed progressive tax, however, takes little to no freedom from anyone, reduces power imbalances, and helps correct the unfairness endemic to capitalism. The progressive income tax is the fairest approach to taxation we’ve come up with. Anybody trying to tell you otherwise is more interested in protecting the power of the few than anything to do with fairness or freedom.